The Aluminum Association, A non-profit organization representing the aluminum sector in Arlington, Virginia. It may be hard to believe, but at one time, aluminum was considered more rare and precious than gold or silver – even though it’s the most abundant metal in the earth’s crust, making up about eight percent by weight of the planet’s solid surface. The reason that this relatively soft, durable, lightweight, ductile, and malleable metal, prized for its ability to resist corrosion was so rare in its pure form, is because the complexities of refining aluminum from its main ore, bauxite, and the other oxide and silicate compounds where it resides, were not successfully conquered until late in the 19th century. But once the processes for extracting and refining pure aluminum had been perfected, far-seeing industrialists and businessmen were quick to recognize its superior qualities. Today, aluminum has not only become a foundation of our country’s infrastructure, its uses and applications pervade every aspect of our lives. From transportation, to packaging, to construction, to electrical transmission, to utensils; in everything from window frames to rocket ships, from rolls of foil to the International Space Station, aluminum and aluminum alloys can be found in abundance. Aluminum was even selected as the material of choice for the capstone of the Washington Monument! Today, the American aluminum industry directly generates $65 billion in economic output and indirectly generates an additional $87 billion in economic output each year – that’s one percent of the country’s GDP (Gross Domestic Product). It employs over 155,000 workers, and for each aluminum industry job, an additional 3.3 employment positions are created elsewhere in the economy, for a total of 670,000 U.S. Jobs. The Aluminum Association is the non-profit organization, based in Arlington, Virginia, that represents the country’s manufacturers of aluminum as well as their many suppliers and vendors. The Association was originally formed in 1933, after the U.S. Congress passed the National Industrial Recovery Act (NIRA), a measure of President Roosevelt’s New Deal initiative, designed to help lift the country out of the Great Depression. The Act required various industries to establish codes and guidelines in order to promote fair and equitable competition. In response to the legislation, representatives of 13 aluminum companies met to form the Association of Manufacturers in the Aluminum Industry. Even though NIRA was repealed the following year, industry leaders decided to continue the organization, renaming it “The Aluminum Association.” Its mandate was to promote the general welfare of the aluminum industry and its members. 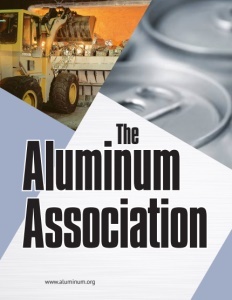 Today, the Aluminum Association continues to represent the interests of the aluminum industry by developing technical standards and data; collecting and publishing industry statistics; promoting plant safety and health; monitoring and promoting technological developments that advance the metal’s use across a wide range of applications; and increasing its market capabilities in the U.S. and around the world. According to Matt Meenan, Director of Communications, the Association currently has just over 112 members, split evenly between producers which make and fabricate the metal, such as Alcoa, Novelis, and Aleris, and associate members, which are the companies that supply goods or services to the producers. Aluminum is infinitely recyclable – nearly 75 percent of the aluminum ever made is still in use today. 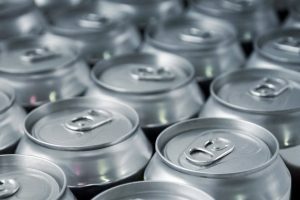 Aluminum cans, for example, are made with an average of 70 percent recycled content, which far exceeds competitive types of packaging. And according to the Association’s website: “Producing recycled, or secondary, aluminum saves more than 90 percent of the energy and produces just eight percent of the greenhouse gases associated with making new, or primary, aluminum.” The Association’s Sustainability Initiative, launched in April 2008, promotes increased recycling, energy-efficient product applications, and increased operating efficiency. In terms of advocacy, the Aluminum Association actively engages with federal lawmakers and regulators, educating them and urging them to pursue policies that will allow the industry to grow. In 2013, the United States Congress created the Congressional Aluminum Caucus – a bipartisan group of members committed to elevating awareness of the U.S. aluminum industry and every aspect of the metal’s production and use. 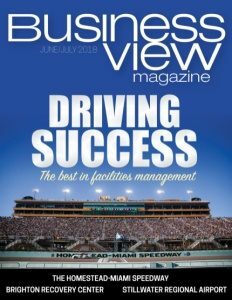 The industry’s top issues include: aluminum recycling, beverage can management, climate change and energy. 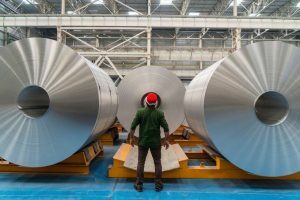 Meenan adds that, recently, the Association has worked with the Trump administration to help instigate a national security investigation into aluminum imports coming into the U.S., particularly from China. “What we saw happening a couple of years ago was a pretty severe problem in the Chinese market in terms of metal over-capacity and so that’s led us down a pretty aggressive trade advocacy path, which is now really a key focus of the industry and the Association,” he reports. As the aluminum industry continues to supply the world with the “miracle metal,” the work of the Aluminum Association will likewise continue to promote its interests and agenda for the benefit of us all. Check out this handpicked feature on The Electronic Retailing Association.